One of the definitions of the word “monument” is “a stone shaft or other object set in the earth to mark a boundary.” This is not exactly what Heid E. Erdrich had in mind in her brilliant new book of poems, National Monuments (MSU Press), though she leaps across boundaries, knocking over markers. The book is about the nature of the monument as metaphor and endangered sacred space, and “the places indigenous people would consider their national monuments,” and the human body as monument, and a few other things, which all make perfect sense to readers as we follow her developing thoughts, one leaping to the next. 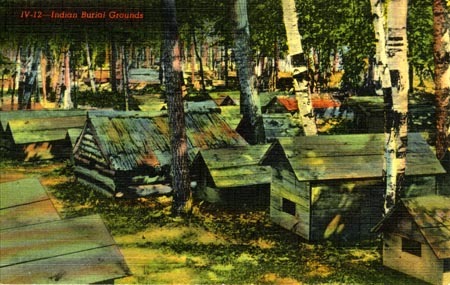 The first and title poem in the book describes a once familiar scene in Minnesota, Wisconsin, and Michigan, a scene still familiar from old postcards—an Ojibwe graveyard filled with rough bark houses, covering graves marked with doodemic clan markers: “Doodem signs, national markers/ the body makes by being born/ that speak your only, only name.” Houses like these were meant “to moss and rot and fail,” not to be kept up with a new roof and a new coat of paint or to survive as a monument of appropriation, meaningful in odd ways beyond the communities where they were created. Erdrich shows the nature of monuments both to the people who create them and to those who have no knowledge of how or why they were made. The geographer J. B. Jackson points out that in American society a traditional monument is civic in nature, meant to remind people of important things: “That is to say it exists to put people in mind of some obligation which they have incurred, a great public figure, a great public event.” People knew of those events and people and traditions kept their meanings alive for generations. Increasingly, he notes, American monuments have taken the form of attempts to reproduce or restore “the original landscape,” in a golden time beyond history. For a society used to appropriating the culture of others, Native Americans and their sacred sites, their monuments, serve this purpose well, providing new ones for people whose own civic monuments have lost their meanings. These beautiful places are sacred for obvious reasons. 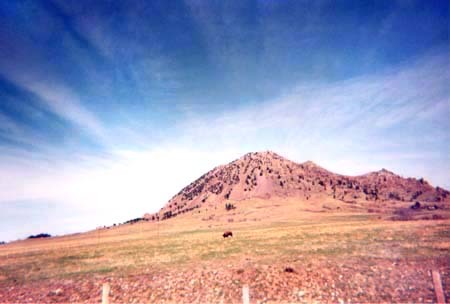 As Erdrich writes, the graceful shape of Mahto Paha, or Bear Butte, in South Dakota draws many, after all, “who wouldn’t put their church here?”—even the riders on hawgs, “bound for a bikers paradise,” who drown out “sacred words pines speak with wind.” The hill, an animal form, does “offer retreat” to all, “To gather and praise at Mahto Paha/ cool in the shadow of her curled form/ tucked right under her yawning paw.” Perhaps, she suggests, Mahto Paha has the power to transcend or survive appropriation. the face of heaven. Everything. Just as important as the land beyond the girls, is what is beyond the edge of the photograph, a cabin, a clothesline, people sitting in lawn chairs, a pump. And even more, all things that happened that day, the events never photographed. “Why do we bear the cruelty of photos—the way they suggest anything/ can stop, any moment can be saved?” The poem itself gives the answer, the nature of the photograph as a monument, a reminder, a piece of a living context and memory, what has always seemed to me the starting point of stories. admire them verbally from time to time. simply, that they are lookin’ good.